The Disco is an old favourite but will the new version be a hit with long-time fans? Travellers the world over love the Land Rover Discovery – it’s comfy, roomy, can tow nearly anything and get you nearly anywhere. Well, now we’re onto the fifth-generation Disco, which was recently revealed at the Paris motor show. And as the more streamlined, less boxy vehicle in these images suggest, there have been some significant changes… some of which may rankle with long- time fans of the iconic off-roader. Land Rover is firmly pitching this as a family hauler to rival other large, luxury SUVs in the mould of the BMW X5 or Audi Q7. If the company is to be believed, the new Disco leaves them in the dust, with Land Rover boldly claiming it to be “the best family SUV in the world”. All variants will offer seven seats but the big development here is you can configure them via your smart phone using the world-first remote “Intelligent Seat Fold” system. Jaguar Land Rover has been working hard on autonomous driving tech and the new Discovery will have semi- autonomous safety systems on board. The exterior changes are immediately noticeable. The front end has been streamlined to look more like the Discovery Sport mid-sizer of the Range Rover stable, though the back end maintains the signature boxy look. But the gentrification of the Discovery has been happening for some time anyway and few people have ever bought one based mainly on its appearance; this is a vehicle defined by what it can do — and how far it can go — once you leave the bitumen. 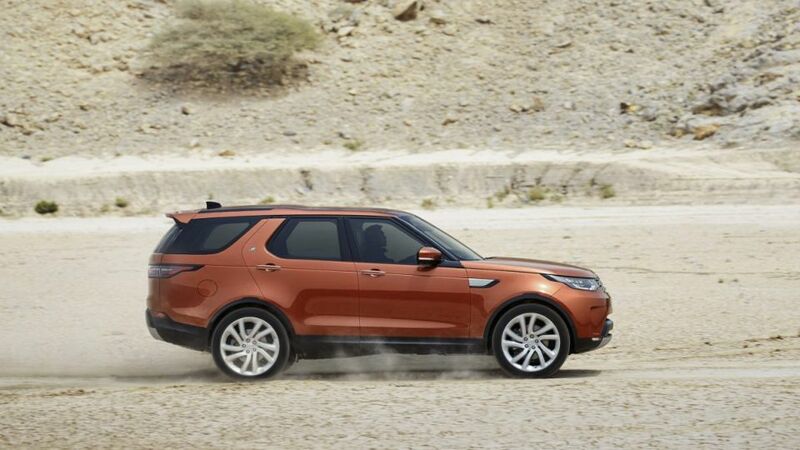 The Discovery sits on new architecture which saves a whopping 480kg on its predecessor. It now uses an aluminium monocoque body, as opposed to the previous ladder- frame steel chassis configuration found on most off-road-aimed vehicles. This more car-like set-up is enhanced by an “integral link” rear suspension set-up, which LR says “delivers superior handling characteristics without compromising the superb ride comfort” of the Discovery. But before you call the new Disco soft, it still has serious off-road cred. It can wade to a seriously deep 900mm — better than the Ford Everest’s previous best of 800mm — while its maximum ground clearance has grown 43mm to 283mm. Air suspension is standard across the range and allows you to drop the car 60mm to help when loading bulky items. It will also, rather chivalrously, drop 40mm when you park to making it easier to get out. There is no standard high and low-range transfer box, with Discos coming with a full-time all-wheel-drive system which splits up to 42 per cent of torque to the front and 58 per cent to the rear. But if you really want a 50:50 split, a two-speed transfer box can be had as an option. It will still tow 3500kg and even has a semi-autonomous Advanced Tow Assist feature which will you out when you’re reversing a trailer or caravan. Keeping the signature boxy rear end means cargo capacity remains generous at 1231 litres with the third row stowed and up to 2500 litres with both rear rows folded – both impressive figures. In keeping with recent models there are a heap of nooks and crannies throughout for stowing smaller items, six 12-volt charging points for fridges or other appliances, plus up to nine USB ports and an in-car wi-fi hotspot for up to eight devices to keep the tech obsessed happy. It’s now an all-diesel affair, with the petrol engine dropped in favour of a trio of oil- burners paired to a ZF eight-speed auto transmission. The Td4 variant kicks off the range, with a 2.0-litre four- cylinder turbo-diesel offering 132kW/430Nm and using 6.3L/100km of fuel. Next up is the more powerful twin-turbo Sd4 four-cylinder offering 177kW and 500Nm, with the six-cylinder Td6 topping the range and offering 190kW and 600Nm. The new Discovery will arrive in Australia in July 2017 and, while full pricing is not yet known, Land Rover has revealed the range will start at $81,590 for the Td4 SE variant — roughly a $12,000 jump on the current entry price.